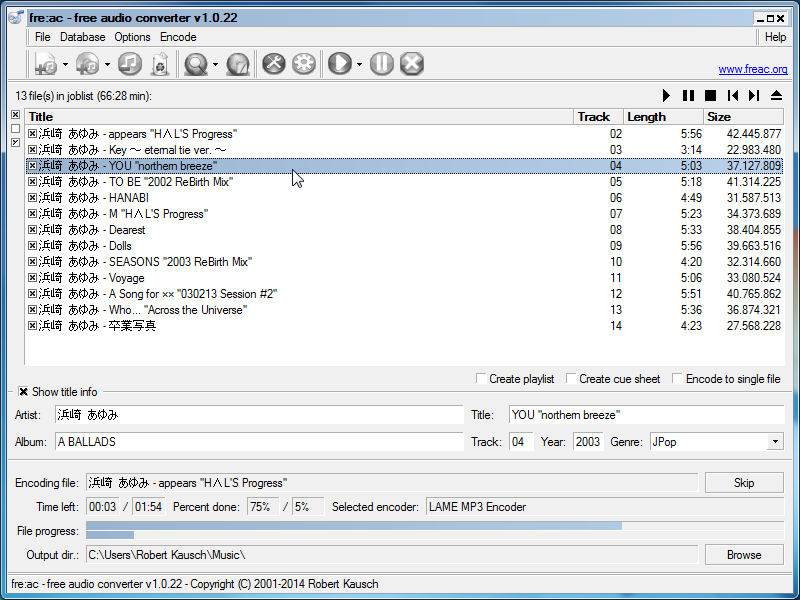 fre:ac (pronounced "freak") is a feature-rich audio tool set featuring audio encoding and conversion, CD ripper, playlist and metadata editor. The program supports most popular audio formats such as MP3, M4A, WMA, OGG and FLAC, as well as support for a long list of additional converters such as Quicktime and Shorten. For CDs, the program supports reliable conversion (CD Paranoia), online databases (CDDB/freedb) and CDText, automatically writing song information metadata. The program is optimized for multi-core systems, making conversions as fast as possible. Functional in 64-bit Windows and cross-platform (Mac, Linux, FreeBSD). Available in many world languages. Alternatively, fre:ac Portable automatically adjusts paths. How to extract: Download the ZIP package and extract to a folder of your choice. Delete translator.exe, unnecessary language and manual files. Launch freac.exe. I prefer freac snapshots to freac stable because the snapshots support more encoders (including the best one- OptimFROG, Monkey's Audio, WavPack, etc). This has been my preferred mp3 ripper for ages. Superb. mp3 file conversion crash with version 1.0.18 and 1.0.19. Also, version 1.0.17 cut first few seconds mp3 files, only bug fix for 1.0.17a works. WMA config crash. If you select wma pro at 100% VBR feac may crash if you try to change it. You can delete the config XML file in application data folder to get another chance to select another WMA pro setting. Maybe it can help with other crashes too? That's besides the point, obviously. Unless John replies, I'm done with conversation. Surely you understand John, PortableFreeware, and PortableApps do not charge for their work? You need an attitude check. They work hard, and share their work free of charge. They are not obligated to do anything. Quite the contrary, you should be grateful! @John, I didn't expect a reply. Okay I understand the patent law is f***ed and needs to be reformed, I get that part loud clear. That's not my main issue as pointed out. I have over 100 apps that are happy to live in Program Files directory. It doesn't matter if you think is a bad idea, you didn't install it there, I did. If your launchers are letting apps leak user data, then you need to fix it. great app., i was using Payware "RiverPast" for my MP3 projects. Now i have a free, light alternative. Running portable software in "Program Files" has always been a bad idea and some apps key on it for using local settings (see also: Sumatra PDF). Plus, they simply won't work due to security settings in Vista and Windows 7 anyway. Splitting the MP3 codec out is due to licensing and distribution reasons (namely, the fre:ac publisher doesn't have a patent license to distribute the MP3 codec which is relevant in some countries). I guess this has to do with using "C:\Programs Files\PortableApps". Still, the PortableApps launcher should stick to it's name regardless where it's installed. Oh well, I wrote my own launcher. How stupid.. the portableapps version removes the mp3 codec and offers it as a seperate download. But that's just a nuisance. the stupid part is that it doesn't even keep the settings that are written to %AppData%\freac . actually that's not very portable at all! Now I have to question if other PortableApps are deliberately leaving settings behind. Download link changed to ZIP-file, because the hotfix-link was not the complete packet. fre:ac supports AAC encoded .m4a files which are the most common. However, there's also ALAC encoded .m4a (Apple Lossless) which is not supported by fre:ac v1.0.x. Support for opening ALAC files has been added in snapshot 20100727. Hawk: I tested this as well and yes the program doesn't appear to read quicktime-encoded M4A files. It does claim to support other formats and can encode M4A files. Workaround: convert M4A files to WAV in iTunes, then open in fre:ac. Never use iTunes' own mp3 encoder. @Ancient: You can call the folder "freac". That's what the installer does as well. And it's pronounced like "freak". The downloads page offers two zip files (at 10-11-15). The 5.5MB freac-1.0.17-bin.zip is the one that works with the "How to extract" instructions. fre:ac? Seriously? They renamed their program to something Win XP can't even handle as a filename? How the heck do I pronounce that, free-colon-ack? @ Robert, thanks for great tool, it looks excellent to me, the installed version works pretty good, i only have one problem with the portable version on by USB Pen, I get the error message: "Windows denys access to the CD Rom Drive - please contact the System Admin" - do you know any help? That 's excellent, thank you for the (superb application) and prompt reply apologies I mean Robert!! The auto updater does not put anything in the registry. It stores everything it needs in eupdate.xml. Is it okay to use the auto updater included or does it put stuff in the registry?. I have the PortableApps.com version. Took me awhile to find the mp3 plugin. Thought I'd paste the link to the mp3 encoder link here to save others the challenge (it's offered as a PortableApp, installed via the PortableApps.com menu). As far as I can tell, the PortableApp version of BonkEnc does not allow for plugins. @Z: You probably downloaded the PortableApps.com version. They removed the LAME encoder from the main package and do now offer it as a plugin for separate download. Unless you want the PortableApps.com menu, you can just as well use the official BonkEnc release. It's portable too and already includes the LAME encoder. When I go to encode I don't have the LAME mp3 option how do I get it? I just got back from using Linux for 2 years to Win and to my surprise, CDex was still the same, old beta. I came across BonkEnc and honestly, I don't see a reason to use CDex anymore. Even with full cdparanoia options, it's rather fast. All CDs I tried so far went smoothly. I didn't check very closely, but it seems it borrowed quite a lot from CDex, can anyone confirm that? And btw, the minimalistic interface is just cool, I like it, nice work. never really works when I need it too. @tim: Thanks for the info! I have both a standard install in C:\Program Files as well as a portable install in C:\Program Files\Portable\Apps. (I use the latter as a holding tank for portable apps that I need to xfer to USB as needed). I just now installed another version in C:\Foobar and indeed this one is creating config files in its own app directory. @Meter: It does not write to C:\ if run from a USB stick. Only if installed to C:\Program Files\. I like BonkEnc a lot, but I don't think it's stealth. Both the help file and my own experience show that it stores configs in C:\Documents and Settings\\Application Data. This is a great little program, I love it! It's easy to use, free, unicode support everything I want! Try it out if you have been frustrated over finding a decent audio conversion program! Design is crazy in a god way. I just used BonkEnc for the first time today and it worked flawlessly. I converted some MP4's to MP3 format for my portable player. I always liked Cdex for ripping, but it looks like BonkEnc might be what I use in the future. @peter: DSS is a proprietary and closed format. The companies behind it do not release any detailed information and do not allow open source projects to implement DSS support. There is no free decoder available for the format, so unfortunately BonkEnc cannot support it. So if you downloaded the three archives of DLLs from MediaFire (above) and you're using that same in_vorbis.dll, 1by1 would not *quite* be stealth anymore (or rather, that plugin would not be stealth). Whatever the (de)merits of this app are, I concur with *ander* above and extend an humble apology for PJ's behaviour. Please disregard any such comments and keep up your effort on behalf of the public good. Wow. Considering BonkEnc is free, and the great amount of time it takes to develop ANY good software, PJ's hostility was way out of line. Robert, since it seems unlikely PJ's going to apologize, I'll apologize for him. After a long experience with mp3 encoders, I've found BonkEnc to be one of the best in ease of use, resource usage and configurability. Onesimus Prime, thanks a million for the "in_wm.dll", the one that doesn't require a separate SDK file. You saved my day, I'd just about given up. It's the only one that works for me. I've had some troubles with 1.0.6 and 1.0.7, but it's still my favorite portable audio converter (and maybe fave overall) - even if I'm stuck back at 1.0.5. Fast, easy, best audio converter I've ever used. The ripped music quality depends on Lame or similar encoders. CDex as a GUI encoder shell is little outdated, but I update LameEnc.dll manually and have no problems. Great work on this program, it's fast and the quality is a bit better than cdex. One suggestion though, it would be nice if there was some sort of audible notification (play a sound) when ripping a CD is completed. can it convert aac into wav or mp3 so i can move my iTunes collection? Tried version 1.0.2 on WINXP SP2. It does NOT recognise my cd drives. PowerEnc is a better solution(It's a tad slower). The cd ripper in good old WMP is simple and faster. I'm aware that the font used by BonkEnc is too small for some people. That will be one of the main concerns in BonkEnc v1.1 development. However, the problem is not as extreme as you say. The font size used by BonkEnc is the Windows default of 96dpi. This is normally used on screen resolutions up to 1280x1024. BonkEnc normally puts its configuration file in the application directory. However, when installed under "Program Files"* it usually doesn't have the right to write to that directory (unless run with admin privileges). So the configuration file is stored under "Application Data" in this case. Considering that, it actually makes sense that being installed under "Program Files" is the deciding factor for that. Lupo73: has someone compared it with CDex?? Thats all I know so far! There was a performance issue when encoding with LAME in BonkEnc versions prior to 1.0 RC 1. The current version should be more than twice as fast. The problem is that, when some months ago I tryed BonkEnc, it was very slow...and not so easy to configurate... is it changed now? One important difference is that CDex is long out of date. BonkEnc at least uses a current version of LAME to encode MP3s. In other aspects, it *appears* to be better than CDex but I haven't tested it much yet. CDex has been popular for quite a while. has someone compared it with CDex?? BonkEnc saves the preferences to "Application Data/BonkEnc" if it is installed under "Program Files". This is to ensure the program can run under a limited user account where the application directory cannot be accessed. If BonkEnc is run from any other place (e.g. another drive or a USB stick), the configuration is written to the application directory. It isn't portable: It saves preferences to Application Data\BonkEnc. And it crashed the first time I saved preferences. The program searches for updates on program startup. You can disable it by deselecting the "Check for updates at startup" option in the "Help" menu.